Then again, Putin doesn’t need any breakthroughs; he’s already getting most of what he wants out of Trump, and given our president’s oft-expressed admiration for authoritarian strongmen in general and for his Russian counterpart in particular, Putin surely aims to cross a few more items off his wish list in Helsinki. American-Russian relations at this moment are somewhat schizophrenic. On paper, Trump’s government is continuing and even going above and beyond many of the tough policies pursued by the Obama administration, including sanctions imposed in response to Russia’s invasion of Ukraine and annexation of Crimea, the sale of weapons to Ukraine to combat the ongoing Russian-backed insurgency, and the expulsion of Russian agents. Yet no world leader has been so much a beneficiary of Trump’s “dictator envy” as Putin. The president has publicly flattered him and even congratulated him (against the advice of literally everyone) on his victory in a transparently rigged election in March. The two men’s previous contacts have been friendly and often advantageous to Putin; they even spent an hour alone together, with no other U.S. advisers or officials and only Putin’s translator present, on the sidelines of last year’s G20 meeting. Trump takes Putin at his word when he says Russia did not meddle in the 2016 election, despite mountains of evidence to the contrary, and even as Russian state TV gloats about it. With Trump, all business is personal, and deals are made or broken on the basis of his feelings about the people he is making them with. Earlier this month, North Korean dictator Kim Jong-un — whose crimes against human rights include forced labor, torture, and murder — made such a good impression on Trump at a summit in Singapore that the president gifted him a unilateral halt to joint U.S.–South Korean war games, blindsiding both Seoul and the Pentagon. Calculated measures are for eggheads and losers; Trump’s gut trumps all. There are many similar gifts Putin might be gunning for in Helsinki, such as a slowdown in those arms shipments to Kiev, an easing of sanctions, or a free hand to do what he likes in Syria. That last one is an idea Trump already likes; he reportedly revived the notion of pulling the U.S. out of Syria and leaving the country to the tender mercies of Russia and its client Bashar al-Assad in a meeting with Jordan’s King Abdullah II this week. The Russians are certainly acting like they’re the ones leading this meeting. “Russia has excelled at controlling the narrative,” Politico reports, as they were the first to go to the press when the summit was proposed in March, and they released further information through their own news agencies, like details of national security adviser John Bolton’s trip to Moscow to negotiate the meeting. Former ambassador to Russia Michael McFaul’s fear, he tells Politico, is that just like in Singapore, Trump will come out of Helsinki praising Putin’s intelligence and strength, with no real, concrete achievements in hand. Worse, the meeting is scheduled for immediately after a NATO summit in Brussels and an official visit to London, so Trump will be fresh from another round of testy meetings with U.S. allies. At the G7 summit in Quebec earlier this month, where Trump went out of his way to alienate some of our closest allies, he reportedly complained in one of his off-the-cuff rants that “NATO is as bad as NAFTA” in terms of being a bad deal for the U.S. He also opined there that Crimea should probably belong to Russia anyway, because everyone there speaks Russian — parroting the Kremlin’s irredentist talking point — and argued for reinstating Russia in the G7, from which it was expelled over the Ukraine debacle. This, even as Trump himself treats the group with contempt and refuses on behalf of the United States to participate in it. At the same time, he is actively working to destabilize the European Union, encouraging key members to quit the organization and saying at a rally this week that the E.U. “was set up to take advantage of the United States, to attack our piggy bank” — an absolutely bonkers statement even if it were not based on an exaggeration of the U.S-E.U. trade deficit. Considering that Russia meddled in the Brexit referendum just as it did in our elections, it’s clear that weakening or dismantling that union is high on the Kremlin’s agenda. Trump’s bootlickers like Secretary of State Mike Pompeo may lamely spin Trump’s antagonism toward our allies as some kind of “disruptive” “reset” in service of U.S. interests, but no administration official has made a remotely persuasive case for why chipping away at these institutions is good for America. For a revanchist Russia, on the other hand, the upsides are crystal clear. With his bad relationships with European allies fresh in his mind, it’s easy to imagine Trump letting Putin talk him into taking more steps to undercut these alliances. 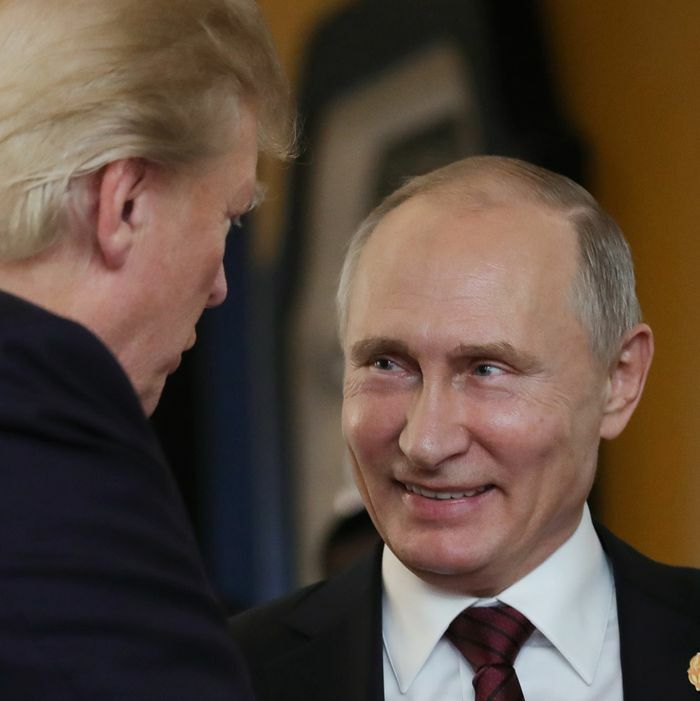 Whether Putin has some kind of kompromat or other form of personal leverage over Trump (a terrifying possibility that becomes more believable the more we learn about the depth of Russia’s machinations in the 2016 campaign), or whether the two men just so happen to agree that the transatlantic liberal order is better off discarded, Putin is already getting what he paid for from this president. Any agreement that comes out of next month’s summit, meanwhile, is overwhelmingly likely to favor Russia’s interests, if only because Putin knows exactly what he wants from Trump, whereas Trump does not seem to want anything more than for the man he admires so much to like him back.